Description Create layered velocity models from well time-depth data. This process creates a layered velocity model from well time-depth data. It requires a windowing model and wells with time-depth pairs. The output of the process is a 3D velocity model filling the specified extents of a 3D survey. At each well, a velocity function is calculated from the checkshots by converting, upscaling and interpolating the values to the model resolution. Each layer of the model is subdivided into "ghost" layers, with conformability based on the window model parameters. For each ghost layer, the algorithm finds the intersections with the well velocity functions and combines the results according to the Calculation Type parameter. Scroll down and double-click Velocity Model (From Well Checkshots). In the Details Panel, select a windowing model to be used in the process at Layer horizons - select a windowing model. Available options depend on the windowing models you have created as described in Creating a Windowing Model. In the Output Extents section, select a 3D survey at Survey to be used in the velocity model building process. Type the range of Inline extent, Crossline extent, and time/depth extents (TWT/TVDSS) for the velocity model and the respective sample intervals. 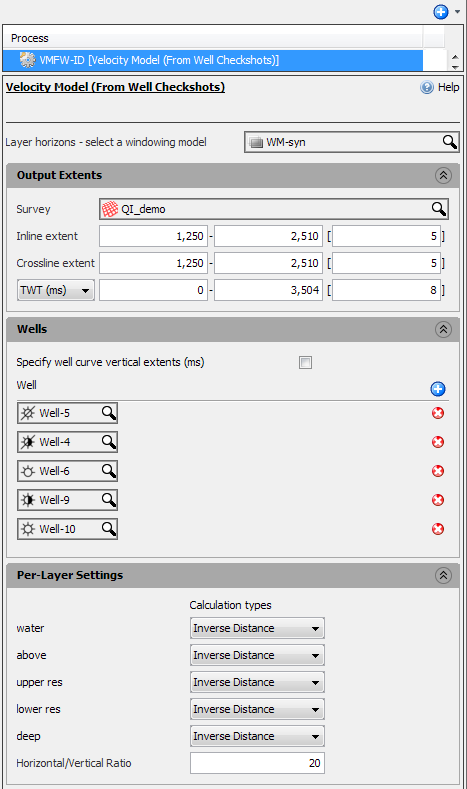 In the Wells section, select the Specify well curve vertical extents (ms) check box to allow you to define the well curve vertical extents for each well that you use in the velocity model building. Click the Add Row icon (+) to add the wells to be used in the velocity model building. 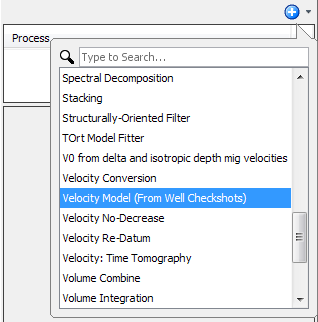 If you have selected the check box in step 4, type the vertical extents of each well that are to be used in the velocity model building. In the Per-Layer Settings section, select the calculation type to be used in each layer of the windowing model. 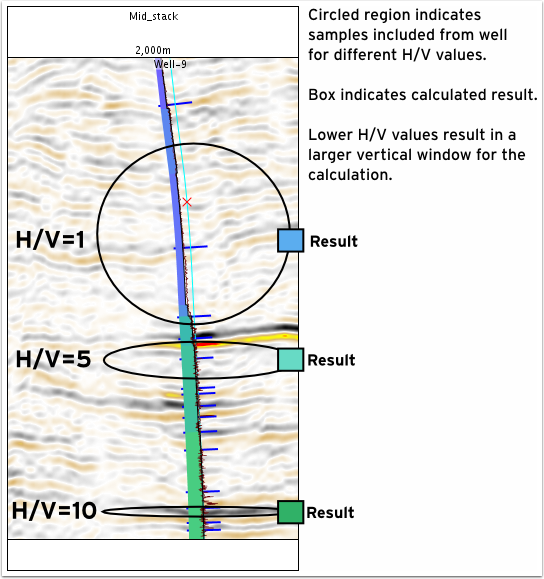 Average of well values — The ghost layers are filled with the average of the intersected well velocities. This generates a model that is constant along X,Y, for each Z value, following the stratigraphy implied by the window model. Inverse distance — The intersected well velocities are interpolated on the ghost layers using an inverse distance function. This generates a model that varies spatially, following the implied stratigraphy, that ties the wells. User-specified constant — Type a constant value for the velocity model in that layer. The layer will be filled with the specified constant (the well velocities are ignored). As a result of this process, a new LF model velocity volume is available in the Volume tab. For an H/V ratio of 1, the sampling is nearly circular. At a distance of 10 units, a vertical region of 10 units is sampled for the calculation. For an H/V ratio of 5, the sampling is very elliptical. At a distance of 10 units, a vertical region of 2 units is sampled for the calculation. For higher ratios, individual samples at the well have a very far-ranging effect. As the distance to the well decreases, the result approaches the actual well samples.